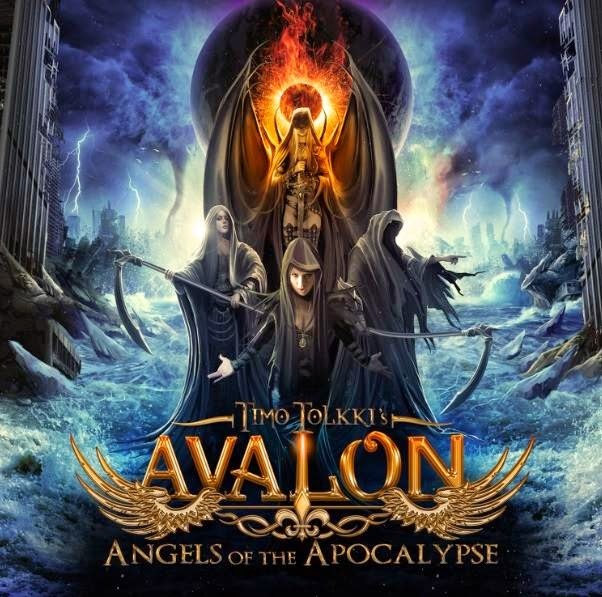 Rock & Metal 4 You: CD-Review: Timo Tolkki's Avalon - "Angels Of The Apocalypse"
CD-Review: Timo Tolkki's Avalon - "Angels Of The Apocalypse"
Metal operas and allstar-projects are all the rage in recent years - everyone knows that. In 2013 former Stratovarious guitarist Timo Tolkki jumped on that train and founded a metal opera project called "Avalon". 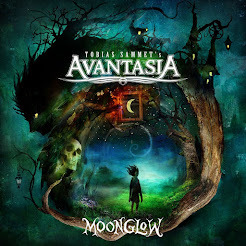 I had mixed feelings about this one: on the one hand it copied a lot from Avantasia, but on the other hand you've found some pretty good earworms and great singers on it. Now, only one year later, Timo Tolkki presents us his second part. I was wondering if the quality of the songs suffers from this short period of time. But first of all let us talk about the story: every metal opera needs that. In "The Land Of New Hope" some of the last humans were searching for this last piece of paradise. Now on "Angels Of The Apocalypse" judgement day is near. If I understand it right the four "angels" earth, wind, water and fire are to blame for this. It's some kind of battle between mankind and nature. You see, the story is a bit weird and serves many cliches. Let's take a look at the line-up: on Avalon part two you'll get to hear Floor Jansen (Nightwish), Simone Simons (Epica), Fabio Lione (Rhapsody Of Fire), David DeFeis (Virgin Steel), Zachary Stevens (ex Savatage, Circle II Cirle), Caterina Nix (a Chilean newcomer) and the beautiful Elize Ryd (Amaranthe). I was very happy that Elize is back here, because I like her voice very much. If you take a look at all those names you know where the journey takes us. While the first Avalon sounded like Avantasia meets Stratovarious, Tolkki focuses this time on a more darker, heavier Symphonic Metal sound. So yes, it sounds very often like Nightwish, Epica or Within Temptation - without reaching their class. I have to say I was a bit disappointed when I saw the line-up, because especially the three male singers can't keep up with their predecessors, named Tony Kakko (Sonata Arctica), Russel Allen (Symphony X), Michael Kiske (Helloween) and Rob Rock. Why Tolkki replaced these first-class vocalists with these new ones? Maybe DeFeis, Stevens and Lione make a good figure in their main bands, but I don't like their performance on "Angels Of The Apocalypse". If you take a look on the female side everything is a little bit more impressive. The girls did a very good job here and they are the only reason why you could give this album a listen. My fears came true: the songs themselves are so damn uninspired and average - it's a shame. They just passed me by without any highlights, without any hooks and without remarkable melodies or special moments. I really don't get it. When I listend to this album for the first time I thought this is a joke. Even after listening to it for many times now nothing grabs me and I can hardly remember haunting melodies. "The Land Of New Hope" had also its problems but at least it featured some very well written, hook-loaden power metal anthems with melodies, which stuck in your head for weeks. On this new album I can't find them. Yes, the darker approach fits to the topic of the story, but this can't be the justification for trivial songwriting. The opener "Jerusalem Is Falling" stands for the whole album: it's heavy, dark, but not intense and free from a good melody. "Design The Century" with Floor Jansen on vocals has a pop-note but sounds also totally irrelevant, while "Rise Of The 4th Reich" is one of the worst songs I've heard in recent years. "You'll Bleed Forever" is the only bright spot on this album as it comes along with a solid chorus and a pretty good atmosphere. But the next songs destroy this impression again: "Neon Sirens" is a bit more melodic, but also uninspired and "High Above Of Me" is a boring piano tune - very well performed, but without any tension. The ten minute long epic "Angels Of The Apocalypse" has again a good atmosphere, but not a real red line in it. Productionwise it's also very disappointing. lead-guitars and vocales are mixed in the foreground, so the record sounds a bit edgy, but the rythm section has major problems: the drums sound like they were taken from a drum-computer - tinny and powerless and also the bass and rythm guitar should be more present on the entire album. It isn't what you would call an epic sound. To come to an end: "Angels Of The Apocalypse" is a weak product, which was written and recorded too quickly and you hear that in every corner. This album is the best example that an allstar ensemble doesn't automatically guarantees a good album - the songwriting is the core element and here Timo Tolkki failes all the track. With this record Tolkki should finish this project. I know this will not happen, because it is concipated as a trilogy, but hopefully the third part will not arrive next year. Hopefully Frontiers learns that it takes a while till you collect a bunch of great songs and to produce an album with an awesome sound. Avalon seems to be the money making machine of this label, which relies too much on its famous guest-singers and forgets everything else. So, who should buy this album? Maybe die-hard-fans of the guest-singers, who collect everything from their idols, can take a look at "Angels Of The Apocalypse". But don't expect that the tunes reach the high class of their main bands. Newcomers, who haven't heard of Avalon before, should check out the debut album, because this follow-up is simply the most disappointing and weakest album in 2014 so far ... at least to me. CD-Review: Elvenking - "The Pagan Manifesto"
CD-Review: Darkhorse - "Let It Ride"